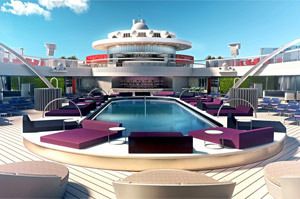 Scarlet Lady is the flagship of the brand-new cruise line Virgin Voyages, scheduled to debut in 2020. During her inaugural season, she will sail from her home port of Miami, taking 4- to 5-night voyages to the Caribbean. Some ports of call that Scarlet Lady will be visiting include Havana, Costa Maya, and Puerto Plata, as well as Virgin's private beach resort in the Bahamas. The staterooms and suites onboard Scarlet Lady are incomparable to any other accommodations at sea. Two Massive Suites (each at about 3,000 square feet in total! 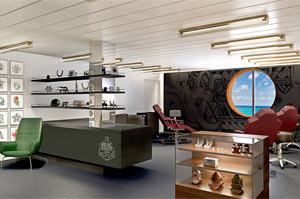 ), designed by Tom Dixon, feature the most awesome amenities found on an ocean liner. Full-length hammocks, an indoor and outdoor Peek-a-View showers, mood lighting, a fully stocked bar, vinyl record players, a music room, lookout point, and terrace with a hot tub, runway table, and conversation pit are some of the exclusive features of these incredible, never-before-seen suites. In addition to your choice of suites, there is also Sea Terrace balcony staterooms, spacious Sea View rooms with a wonderful view of the ocean, and roomy insider staterooms for those looking for affordable yet cozy living spaces. The only way to describe the onboard entertainment onboard Scarlet Lady is "rebellious." Virgin Voyages pulls back the curtain to reveal pop-up performances, drag shows, world-renowned DJs, and other boundary-breaking, rule-defying fun. In place of a traditional main theater is the world's first-ever transformational theater space, which can go from display to dance floor within minutes. The Aquatic Club takes place of a traditional pool deck, blurring the line between poolside and yacht club. Another standout feature of Scarlet Lady is the free group workouts, which usually cost extra on other cruises. Whether you want to enjoy a satisfying mud bath or salt scrub in the spa or get that new ink or piercing you've been talking about for months at the tattoo parlor (or both), Scarlet Lady has you covered (literally). There are no buffets onboard Scarlet Lady and all dining venues are free. 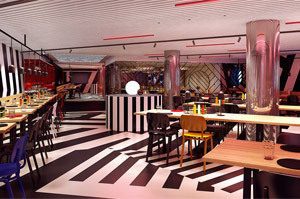 Virgin Voyages has partnered with culinary geniuses such as AvroKO to bring you a dining experience like none other. No matter your mood, you'll always find the perfect venue for your occasion. Steak and seafood reminiscent of Madison Ave, a cooking lab inspired by Escoffier Ma Cuisine, a whole venue dedicated to vegetarianism, DIY Korean BBQ, and an upscale Mexican restaurant are some of the distinct offerings you'll discover. In place of a buffet, there is a food truck-style galley. 24-hour room service is available for night owls who don't stop partying 'til the day is done! There's no better way to celebrate your time at sea than with some body art to prove it! Preserve your good time forever with a new tattoo or piercing at Squid Ink, Scarlet Lady's very own onboard tattoo parlor. Inspired by sailors who would celebrate nautical milestones with ink, you now have a chance to do the same. The expert tattoo artists maintain a safe and hygienic environment. Whether you choose from a premade design or have a custom idea in mind, you can finally bring it to life onboard Scarlet Lady! At the very top of Scarlet Lady is an outdoor yoga studio where you can easily find your balance beneath the Caribbean sun. Stretching, meditation, and yoga are the name of the game in this tranquil space. What better way to find yourself while you're at sea? Top your morning off with a fresh, cold-pressed juice from the juice bar. 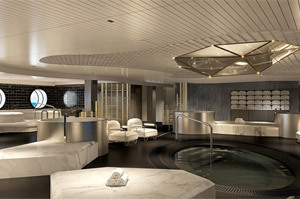 Whether you're new to the wellness scene or an experienced guru, you'll love the wellness ambiance found onboard this ship! Staying in style is easy onboard Scarlet Lady, and the fabulous amenities offered in every stateroom brings it to life. 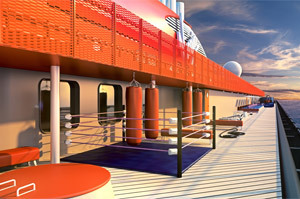 From technologically-advanced designs that provide with you with all the plugs and outlets you need to unique extras such as game consoles, transformational Seabeds, to glam areas, window seats, terrace hammocks, and more, these staterooms have it all! Suites feature extra-amazing amenities like marble bathrooms and fully stocked bars, leading up to the two Massive Suites, which feature a music room, terrace hot tub, and more. Amenities differ by stateroom but no matter where you're booked to stay, you're going to love it. Visit Virgin's private beach club in Bimini, Bahamas as a stop onboard Scarlet Lady! Turquoise water and white-sand beaches await you, as does endless entertainment. You'll get up close and personal with a diverse mix of marine life. Boating, snorkeling, and diving to historic shipwrecks are just some of the incredible experiences you can have here. The Beach Club experience brings you tranquil mornings and nonstop afternoons, topped off with a beachside bonfire at night. You definitely don't want to miss your chance to experience this exclusive club for yourself! Low Price Guarantee on all Scarlet Lady Cruises! Book any Scarlet Lady cruise with us and you'll get the best deal possible, regardless of the ship or sail date! 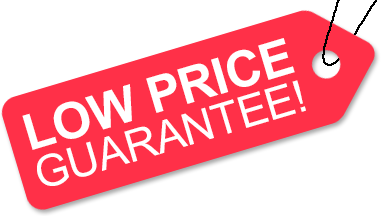 Because of our "Low Price Guarantee," nobody beats our Scarlet Lady cruise prices, so look around and you're sure to find the best Scarlet Lady cruise deal possible when booking with us! We do not charge booking fees on any cruises! You're sure to enjoy an affordable Scarlet Lady cruise when booking with us! Our special offers on Scarlet Lady cruises may not be combinable. Positioned forward for unparalleled views. Three room space including a private music room and European king bed in bedroom. Private terrace features hot tub, full-size hammock, sun loungers, champagne table, conversational pit, lookout point, and open air Peak-a-View shower. Private marble bathroom features Peak-a-Boo shower. Sleeps up to 4. Private marble bathroom w/ glass-enclosed Peek-a-Boo shower. Additional half bathroom. Peak-a-View shower, sofa, loungers, and champagne table on private terrace. European king size bed and chaise lounge in bedroom. Sleeps up to 4. European king size bed and chaise lounge in bedroom. In-room bar and record player. Private terrace w/ sun loungers, champagne table, a Peak-a-View shower. Private marble bathroom w/ Peak-a-Boo shower. Sleeps up to 4. European king size bed and vinyl record player in bedroom. Fully stocked in-room bar. Private marble bathroom with Peak-a-Boo shower. Private terrace with Peak-a-View shower and sun loungers. Sleeps up to 4. European king size bed, vinyl record player, and fully stocked in-room bar. Private marble bathroom with Peak-a-Boo shower. Private terrace with hammock. Sleeps up to 4. Panoramic views from corner terrace with champagne table, hammock, and seating. European king size bed, vinyl record player, and fully stocked in-room bar. Private marble bathroom w/ rainshower. Can interconnect with adjacent Sea Terrace. Sleeps up to 2. European king size bed, vinyl record player, and fully-stocked in-room bar. Private terrace w/ hammock, champagne table, and seating. Private marble bathroom with rainshower. Sleeps up to 2. 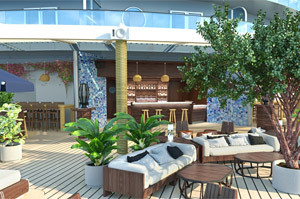 Aft-view terrace w/ sun loungers, hammock, and champagne table. European king size bed, vinyl record player, and fully stocked in-room bar. Private marble bathroom with Peak-a-View rainshower. Sleeps up to 2. Features personal tablet, mood lighting, music controls, movie streaming, one-touch room service and transitional European queen Seabed. Private bathroom w/ rainshower. Sleeps up to 3. Features personal tablet, mood lighting, music controls, movie streaming, one-touch room service and transitional European queen Seabed. Private bathroom w/ rainshower. Sleeps up to 4. Features a picture window w/ window seat and Seabed, plus a private bathroom w/ a rainshower. Sleeps up to 3. Features a picture window, mood lighting, and large single bed, plus a private bathroom w/ a rainshower. Sleeps one. Features a large single bed, private bathroom w/ a rainshower, and mood lighting. Sleeps one. Features a Seabed, private bathroom w/ rainshower, and mood lighting. Sleeps up to 3. Features 2 bunk beds (4 single beds), mood lighting, a game console, and private bathroom w/ a rainshower. Sleeps 3; Includes a Pullman bed. Sleeps 4; Includes both 2 lower beds and 2 Pullmans. Deck plans provided are subject to change. We reserve the right to correct errors. Please verify all information with the cruise line directly. 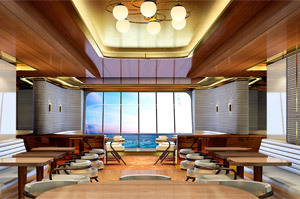 ♦ View other Virgin Voyages cruise ships: Coming Soon!